Impact Wrestling has a preview up for their first episode of 2019, which is the go-home show for their “Homecoming” pay-per-view in Nashville on Sunday. 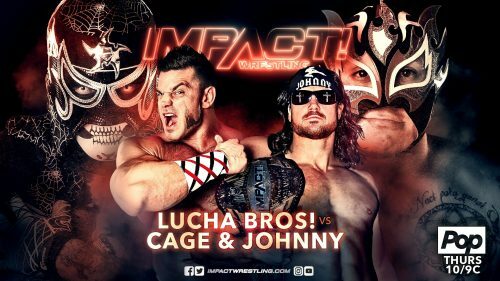 Tonight’s main event is Johnny Impact & Brian Cage taking on the Lucha Bros.
Thursday night marks the final IMPACT before Homecoming LIVE on Pay Per View this Sunday. It is also the final IMPACT on Pop before we move to Friday nights on The Pursuit Channel. 2019 promises to be a big year for IMPACT Wrestling and now is the time to see which Stars will rise to the occasion. Who will step up on the final IMPACT before we head to Nashville. Check out their full preview right here.